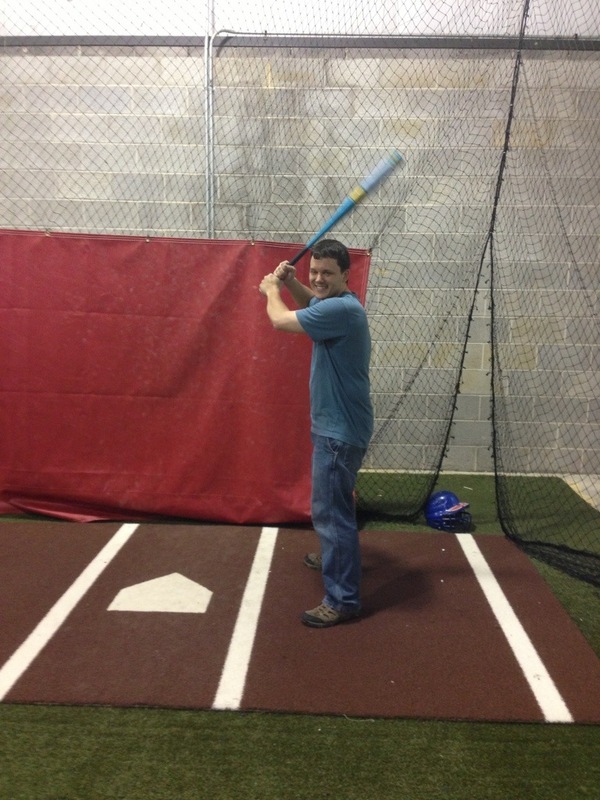 For Bart’s birthday in April, I purchased a Groupon for an hour of batting cages in Gaithersburg. We went to one a few years ago with some family back in Arkansas, and it was on our list of things to do again. So when I saw the deal come around, it seemed like a natural thing to do. Unfortunately, it took us a while to get around to it, since right after Bart’s birthday we got busy with travel and house hunting. But after a rough commute home today (you’re seriously going to close one entire lane of northbound Connecticut Avenue on a Friday afternoon during rush hour? Seriously? ), I knew that beating the crud out of something was just what the doctor ordered. Now, despite watching baseball all the time these days, neither of us know anything about actually playing it. But we grabbed our bats and balls and headed out to our cage. It took a whole 5-gallon bucket of balls each before we got our stride, but before too long we were making contact. I’m a big wuss, so I whined a lot about the balls being too fast or too slow or too close together or whatever. But I managed to finally get quite a few solid smacks. Take that, road construction. 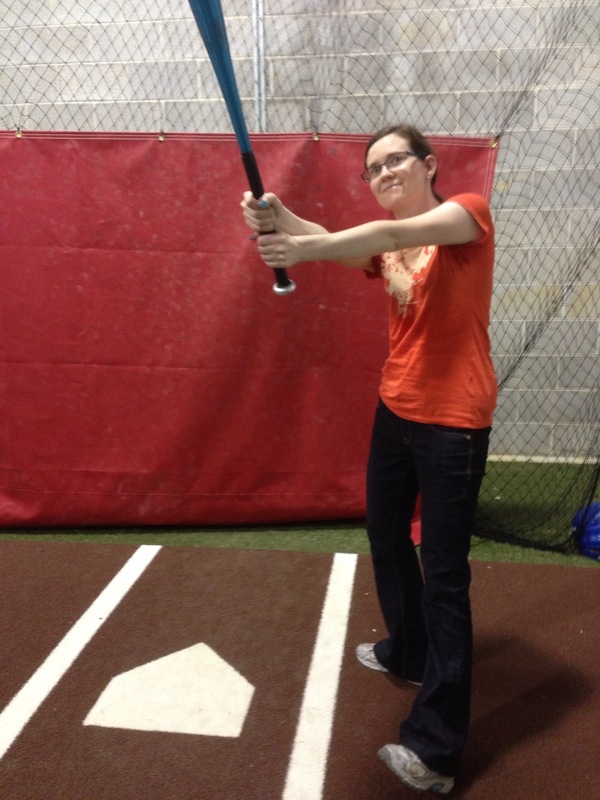 By the end of the hour, we had blisters on our hands from gripping the bat with our dainty palms. Next time, we need some batting gloves. But we had a good time, and who knows? Judging by the number of players on my fantasy baseball team that keep going on the disabled list, the major leagues might be desperate for some hitters in the near future. You just never know. I am just not cut out for real estate in this town. I’m all about variables. Algorithms. Patterns. Statistics. Real estate is, evidently, about emotion. Desire. Vagueness. Mystery. Or at least this is the impression given off by most of the real estate transactions these days. 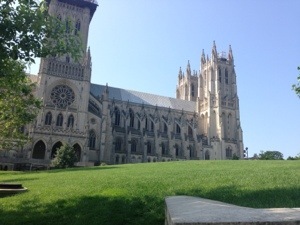 I’m no real estate expert or economist, and I don’t know what the market is like around the country, but things have been hot, hot, hot here in the DC area since, oh, precisely about the time we started looking at houses. Of course. DC is a unique market, where there’s always a high demand which has artificially driven prices up relative to other spots in the US. Then the real estate bubble happened in the 2000s, meaning a lot of people bought homes who couldn’t afford them, and prices artificially escalated even more. Once that bubble burst, the market here tanked. People had too much money in their homes to be able to sell, so there wasn’t much buying going on, and there’s been a low supply of homes on the market. However, with historically low interest rates, people have been scrambling for homes. With low inventory and high demand, it’s made things absolutely nuts for someone trying to buy a home. Houses with even a tiny bit of upgrading are snapped up within a couple of days. Bidding wars have escalated prices far beyond asking price. This, therefore, has encouraged sellers to start raising their initial asking price, and it appears that we’re in another mini-bubble again. This obviously makes it tough for us to find a house that’s reasonable without thinking we’re getting ripped off. I mean, prices are high enough already; we’re sort of getting ripped off anyway. 😉 But we don’t want to overpay and be in the same boat as so many other people who have more in their house than it’s worth. So we’re trying to find a house that suits our needs and desires–and we probably have some different ideas of what we’re looking for than your average couple–while not getting taken to the cleaners. So obviously, we want to make sure we’re paying a fair price, but determining what that is is very complicated. Back in Colorado. it was fairly easy to nail down a range of prices that a house might fall in. There were only a few parameters to consider: 1. how far is it from Boulder (price inversely proportional to distance), 2. what neighborhood it was in (a finite number of neighborhoods in the area), and 3. How big is it (number of square feet on the listing = actual number of square feet in house). Here, it’s just a tiny bit more complicated. 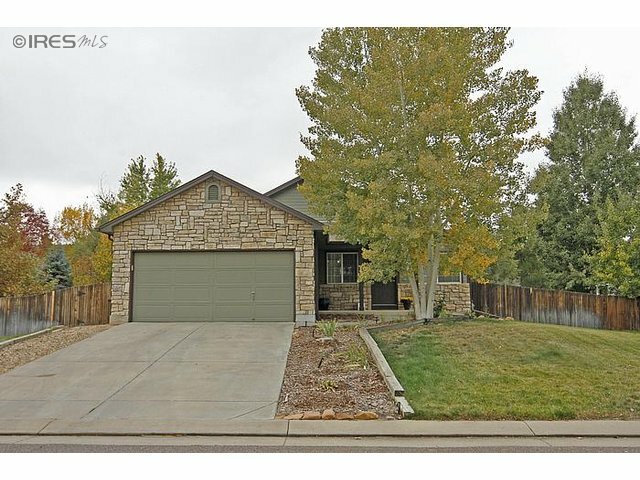 Our happy home in Colorado…minimal variables! Yes, one does pay a premium being closer to DC, but prices aren’t necessarily uniformly decreasing radially outward; in fact, in Maryland there’s a clear price gradient clockwise from the Potomac over to the east. Then there are pockets of neighborhoods here and there that, for whatever reason, are priced at a premium relative to other homes. And then there’s McLean, which is evidently a black hole of six-figure earners and probably famous people. I’m not sure Bart and I can even afford to drive across it. Another issue is that homes are much older here than we are used to in Arkansas and Colorado. When we looked at houses, we looked at neighborhoods of very homogeneous homes built at the same time and not requiring too much work, but the difference in the “older” homes and new houses were at most 30 years. Here, the majority of homes were built before any of those Colorado neighborhoods existed. Now, over the course of 50 or 60 years, many people have owned these homes and performed various levels of updating to them. So within the same neighborhood here you could have original 1950s homes that haven’t been touched next to ones that have been totally gutted and renovated in the last year next to a brand new home that was built where an old one was demolished. And how much a house is worth relative to the amount and quality of renovations is really hard to put a number to. Another confusing issue is square footage. The amount of space claimed in the listing is usually not reflective of the actual livable square footage in the home; if a basement has been finished or a room added without the county considering it livable space, it’s not reflected in the listing. Sometimes the listing is true to life, other times it’s only half the space that’s actually there. So pricing a home by square footage is pretty much bogus, too. So, my previous experience with homes had few variables that were easily comprehensible to my scientific mind. I could almost imagine an equation to sum it all up. This market feels like chaos theory. I have really been struggling with nailing down an exact science behind the market. I thought real estate agents would know, but any help I get from them is just “oh, look at the stuff that’s sold, and that’ll tell you what this house is worth.” With all the variability from one home to another, that’s not exactly scientific to me. The best I can do is take an average of “sold” prices in the last six months, but to me, that’s like comparing apples to green beans with all the different parameters out there. Okay, who am I kidding? I still want a formula. :p Regardless, Bart and I are still looking diligently, and hopefully we have a few tactics to circumnavigate the current craziness while still landing a house that can ultimately be our home. I took this photo last Friday. 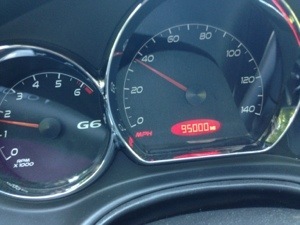 I am incredulous that my car, which still feels new to me, has 95,000 miles on it. We purchased my car just a few months after we got married, which got me thinking…. Bart and I probably had five thousand miles under our belts in those three months between getting married and buying that car. We drove to and from our honeymoon, then a few days later we packed all Bart’s stuff and drove another thousand miles to move him out to Colorado with me. So does that mean that after 7.5 years, we’ve got a hundred thousand miles on our marriage so far? Is there regularly scheduled maintenance for that? When I was feverishly writing my thesis in the winter/spring of last year, I felt very cramped and stressed spending day after day crouched over a keyboard staring at a computer monitor. I obviously had a lot to do, but I decided I had to get out from behind my desk or I would go bonkers. For some strange reason, I decided that running was the thing I just had to be doing. Now, I’m not a runner, I tell myself and everyone else. I tried it before but I didn’t stick with it very long. But for whatever reason I had in my brain, it seemed like the thing to do. I started something like a couch-to-5k program and hit the streets. A few days later, my good friend Mary-Hall said she had also started running and was planning to run the infamous Bolder Boulder 10k on Memorial Day. I scoffed at the idea of me running 6 miles, but I needed an outlet, and I had a goal and accountability, so I started Hal Higdon’s 10k for beginners program with just enough weeks to spare to start training. And you know what? I did it! I didn’t have an amazing time, nor did I manage to run the entire race without walking a bit, but I did it. I was almost as proud of myself for that accomplishment as I was for my PhD, which I had earned a few weeks before. Almost. I kept running some that summer, but without a goal and with the time crunch of moving, it fell by the wayside. I didn’t pick up my shoes again until a few weeks ago when I began running during the day from work around DC. We have a great program at work where you can get a couple of hours each week for exercise, so after the dreary winter gave way to warmer days, I thought it might be time to give running a try again. Ironic statement: running in DC northwest is hillier than running in Boulder. Or at least it’s the case where I’m located. You see, I work at an observatory, and those are, well, always built on a hill. So no matter which direction I go, I face some serious elevation climb either coming or going. That’s certainly made it a challenge to gain back both my speed and distance, but I think I’m making progress. Running here is quite a different experience than running in my neighborhood back in Colorado. First, there are definitely more trees. That makes it shadier and more verdant, which I like. But then this also happens, which I’m not all that excited about. Thank the good Lord I haven’t encountered that yet. Running here is also a jarring combination of bustling streets, quiet neighborhoods, wildlife refuge, and tourist attraction, all within a couple of blocks of each other. One day I’m dodging tourists near the cathedral, the next I’m dodging foxes in Rock Creek Park. 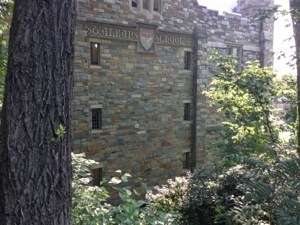 This route also takes me by a school that kind of looks like Hogwarts. I will never be the world’s greatest runner, and that’s okay. I’m just so thankful I am healthy enough to get out on my own two feet and be mobile. One day that won’t be the case, so I try very much to appreciate the gift while I have it. Hopefully I can keep it up and get stronger and faster. But no matter how slow I go, it’s nice to just get out a bit and pound it out. From the standpoint of a season being a time of year defined by similar weather, I’ve always thought that the beginning of seasons should really be acknowledged midway between the canonical astronomical points in the earth’s orbit around the sun (solstices and equinoxes). These days, such as we will acknowledge tomorrow for the summer solstice, actually mark a turning point or a midpoint in the earth’s yearly cycle. But as far as defining a three month period of the most homogenous weather, I would say that summer actually started midway between today and the vernal equinox in March and will end in about six weeks from now. Nobody asked my opinion, though. However, I believe that my feeling about seasons exhibits a very human characteristic of preferring homogenous, uniform circumstances to what ultimately boils down to change. I like to be steady state. I like a routine. I like to know exactly where I’m going and how I’m getting there. I find little need to be hasty. However, while we will all have those homogenous seasons, I’ve learned in the past year that life really takes its shape and definition by the turning points. I was in a very long season of life during graduate school, and I grew very accustomed to my circumstances. When I graduated last year, it was a turning point, a place where a new season was beginning. I recognized this and thought I was at peace about this fact and would stoically ride it out, but over the last year and a half I’ve realized that this transition wasn’t just one point–graduating, finding a job, moving, buying a house–but it’s an entire season itself that has lasted longer than I expected. That doesn’t mean that life isn’t good now; on the contrary, I have so much to be thankful for, and I do remember that every day. However, it’s too easy to focus on the fact that this transition time isn’t immediately resolving into a new homogeneity. I don’t know how long this season will last. Maybe when we buy a house and finally get settled in a permanent abode? Maybe when we join a church and get involved with relationships and projects and ministries? Maybe I will just wake up one day and realize I’m there. I feel like I’m always blogging about the same thing here, a general dissatisfaction with having to be patient or being in flux. But it has been one of the most obvious and expected consequences of our move, and I’m continually amazed at how long it has lasted and how it has affected me, hopefully by molding me into a better, more mature person. So now that it’s summer and our terrestrial trajectory has just transitioned, I’m going to embrace what life is now instead of being sad that winter will be coming again, even if its still months away. I’m going to enjoy the current warmth and sunny days instead of only being satisfied with what perceived stability the future will bring. Yesterday, Bart asked me if I’d ever heard of a derecho before. Evidently he’d heard on the news that the severe storm was forecasted for our area on Thursday. I had to go read about them and learn what the fuss was about. A derecho is basically a line of storms with damaging, straight-line winds and heavy rain with the possibility of producing hail and tornadoes. I’d never heard of such a storm before I moved to DC, but initially I learned about them by hearing of the one that occurred at the end of June in 2012. The storm ripped through the area, downing trees and shutting off power to huge chunks of the city. Then it got ridiculously hot in the following days, making for some uncomfortable and dangerous conditions for many people without electricity. Nevertheless, I was having a hard time getting very worked up about them. I mean, I’m from the south. I know about thunderstorms…big deal. I don’t do tornadoes, but thunderstorms I can handle. When I woke up this morning, I had a federal government operation status update in my email. I was a little confused, as these are usually reserved for real, serious weather conditions that threaten the ability of government agencies in the area to stay open for the safety of the workers. You know, in case of a foot of snow and such. The status was open, but with the option for unscheduled leave or telework. I peeked out the window, and I certainly didn’t see any cause for all this alarm. Big deal. When I got to work, I received an email stating that we were being allowed 59 minutes of early dismissal leave to accommodate the adverse weather conditions. And by adverse I mean that I might have even seen a peek of blue sky after lunch. I’m starting to think people here are a little antsy about weather. Nevertheless, I never complain about getting to leave work an hour early. I headed out about 3:00 with this alleged storm approaching southern Maryland imminently. I stopped by the post office to mail a package and pulled into my garage somewhere around 3:45. I was in the house for about two entire minutes before I looked outside to see a wall of water coming at us–rain being blown completely sideways in sheets and trees bending over to the ground. There was an utter deluge for about three minutes, and then it stopped. Well, I thought, that was impressive, but kind of short lived. Is that it? Then our power went out. Sure enough, that was the extent of the storm here in Maryland. Just a few minutes of crazy wind and rain before it passed; maybe not enough to be a full derecho but close. While it didn’t last long, we quickly realized that the aftermath was quite significant. With the power out at home, I couldn’t fix any dinner. We decided to venture out and see if we could locate any restaurants with power anywhere. It wasn’t long before we saw the extent of the damage. The metro area is chock full of beautiful trees and ugly overhead power lines…it’s almost guaranteed that power is going to go out when a storm goes through. There were downed branches everywhere, and in a few places we saw where multiple trees had blown across the road but had already been removed by county and city workers who are no doubt trained to expertly handle these situations. The power outage also meant most traffic lights were out, making rush hour traffic even more heinous. We even saw a huge billow of smoke south of us, but we had no idea what it was; we did see plenty of emergency vehicles as we slowly made our way into town. Hopefully that situation turned out okay. We also got an alert that there was a confirmed tornado spotted just to the northeast of our town. Did I mention I hate tornadoes? We managed to make it to Rockville Town Center, where half of the streets had power and half didn’t. Fortunately, a couple of restaurants were open, and we had some burgers and walked around a bit before heading home again via an alternate route. Our power was still out, but I’m very thankful to report that it came back online a little while later. We were out for about three hours, which was better than I had feared. All in all, we may not have had the full blown derecho, but the aftermath was still quite significant. Despite my skepticism of the severity of the storm, it proved to be worthy of respect and consideration. I’m thankful that we had minimal impact from it and hope others did as well. Maybe this will be the extent of significant weather for us this summer. Wait a minute……our lights just flickered again! You can’t be serious…..
Today marks seven months since our move. For once, this doesn’t coincide with any other notable events, so without further ado…. Escaped the fenced backyard while chasing a squirrel (actually that was Murphy…how on earth did he get out??). Figure out how to keep squirrels away from the birdfeeder (evidently Murphy just isn’t that threatening).